Flu season is among us and has hit full force this season. The flu virus is always changing, but that doesn’t mean your healthy habits should be. Several people are affected every year due to the flu, but there are simple ways to prevent it from spreading and keep yourself from getting sick. Hard to do if you’re a people person, but keep your distance from those around you that are sick. Wash your hands! Germs are everywhere and in almost everything we touch. Keeping hand sanitizer and wipes are also super helpful for on the go. Keep your hands away from your face. It’s a habit many of us have without knowing it, but germs can easily spread this way. Clean those smart devices! Your phone, laptop, Fitbit… We touch these items too many times to count throughout the day. Clean off those surface germs to help prevent getting sick. Nutrition! Eat healthy and drink plenty of water. Relieve your stress, in whichever way works best for you. If we all commit to following these simple steps, we might be able to keep our neighbors, loved ones, and community a little bit safer this flu season. Get more health and safety tips and tricks in the palm of your hand. Download the Red Cross First Aid App for smartphones and tablets. With videos, interactive quizzes, and simple step-by-step advice it’s never been easier to learn first aid! The following blog post is written by guest writer Brian Bullock and was originally published by Pacific Gas & Electric Company. The Red Cross is proud to be celebrating a 40-year safety partnership with PG&E. Beverly Jones utilized CPR training she received through PG&E to save her husband Michael’s life. Like a lot of PG&E employees, Beverly Jones has sat through her share of Safety Minutes prior to meetings where the facilitator assigns someone to phone 9-1-1 in case of an emergency, someone to chase down the closest automatic external defibrillator and then finds someone who is certified in cardio pulmonary resuscitation. Even though she was certified to perform CPR, she admits she was reluctant to volunteer to use it, at least until Oct. 22 when she had to use it to save her husband Michael’s life. Beverly, who started working at Diablo Canyon Power Plant as a contractor with Pullman Construction 32 years ago and now is an administrative specialist at the Old Santa Fe Road warehouse, was sitting with Michael, whom she met when they were both working in the General Construction Mechanical department over 30 years ago, watching the San Francisco 49ers get soundly thrashed by the Seattle Seahawks when Michael, after several days of not feeling well, went into convulsions and slumped lifelessly onto the couch next to her. “We thought he had flu symptoms. Started on a Tuesday. He just couldn’t keep any food down,” Beverly said, recalling what led up to her husband’s collapse. “It just seemed like what people have when they get the flu. Michael and Beverly Jones, who met working at Diablo Canyon, are pictured here on vacation in Belize. Just that quickly, Beverly pulled Michael onto the floor of their San Luis Obispo home and started chest compressions to keep him alive. She said she was lucky that she had been recertified in CPR in a class at PG&E’s warehouse organized by coworker Karen Reitzke, a buyer in the company’s supply chain, on Oct. 2. She had taken a similar class to be certified some 20 years earlier at Diablo Canyon. In the heat of the moment, though, she got confused about exactly what to do. CPR training has changed since she first took the class, going from both chest compressions and mouth-to-mouth breathing, to just solely chest compressions. “It was kind of weird to me, I remembered I had to do compressions and I knew I needed to breathe, but I forgot to start counting. Then it was like ‘Oh wait, I don’t have to breathe,’” she explained. “I was by myself and so I knew I had to call 911, but I still had to do the compressions. I called 911 and I was trying to hold the phone and trying to do compressions and (the operator) told me to put the phone down but don’t hang up. Eight firefighters from the San Luis Obispo Fire Department and a San Luis Ambulance crew all converged on the Jones’ home. After Beverly left Michael long enough to let them in, they went to work and had to use an AED three times on Michael to get his heart started again. “I heard them have to put the paddles on him and do the “clear” three times. So essentially in my brain, I think he died three times. I heard one of them say ‘Go check on the wife,’ and I’m thinking, ‘Oh no! That’s me,” she continued, adding she was downstairs trying to calm their dog, Bella, a protective Weimaraner who had been frantically barking when the responders invaded her home. By that time, she was sequestered downstairs as the EMS people worked to revive her husband. It wasn’t until she heard Michael moaning that she knew he was alive. He was taken to French Hospital Medical Center where he spent 11 days in the Intensive Care Unit, part of it in an induced coma-like state. Beverly learned from the doctors that her 59-year-old husband actually had developed pneumonia and had aspirated which caused sepsis, a blood infection, which led to his cardiac arrest. Over the next several days, Michael and Beverly were visited by three of the eight firefighters and the ambulance driver who responded to their emergency. It turned out that firefighters from Station 1 and Station 4, along with an ambulance crew all responded to Beverly’s 911 call, and it was a good thing, too. It took many of them to get the 6-foot-4, 230-pound Michael strapped to a backboard and down their home’s narrow stairs. Coincidentally, one of the emergency responders was at San Luis Obispo’s Farmers Market giving CPR lessons to children. Beverly learned from a nurse in the ICU that what she did to keep her husband alive as she waited for help was pretty amazing, too. The nurse told Beverly that there was another man in the ICU who hadn’t received CPR prior to the EMS response and she said they weren’t sure if he was going to make it. Michael is back at home with an internal defibrillator inserted into his chest and outside of a sore throat, which resulted when he removed his own aspirator, and a few cracked ribs, courtesy of Beverly’s energetic CPR, he’s doing fine. The whole experience proved just how valuable taking those CPR classes through PG&E was to her and her husband. It also had her thinking back to all of those Safety Minutes she has been through. “The thing is, is I was always the one who was reluctant to raise my hand when they asked for CPR certified. I wasn’t sure I wanted to be responsible for someone else. I’m sure I’m not the only one who feels that way. There’s just something that makes you hesitant to go, ‘Hey, yeah, I’ll be the one that saves that person’s life,’” she admitted, adding that has all changed, now. “Essentially, for people who don’t know what to do, they need to do something. Do anything. It’s what she did remember that saved her husband’s life. 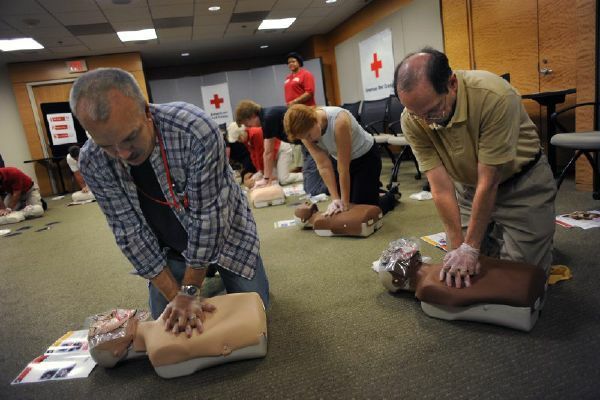 The Red Cross offers a wide range or CPR/AID/First-Aid training courses. Find an upcoming class near you by visiting redcross.org/take-a-class. Beverly’s story is part of the Heroes for the American Red Cross series, where local, everyday heroes are honored for their compassion and courage. Learn more at redcross.org/sloheroes. Day in the Life: CPR Class, 9:00 a.m. – 12:00 p.m.
Hilary Swartz had just made her way into Fresno and was beginning to set up her classroom. The drive from her mountain home isn’t the shortest or the easiest, but she’s happy to do it in order to teach a new class of eager CPR students. She flicked on the lights and began lining up her practice manikins. Hilary began volunteering with the Red Cross just a few months ago, but she is already a DAT responder and preparedness educator in addition to teaching CPR/AED/First Aid and babysitting courses. Like many volunteers, Hilary often goes above and beyond her normal duties. She’s known for taking her knowledge into her own, often hard to reach, rural community. Her proactive approach to education is what makes her a great volunteer. 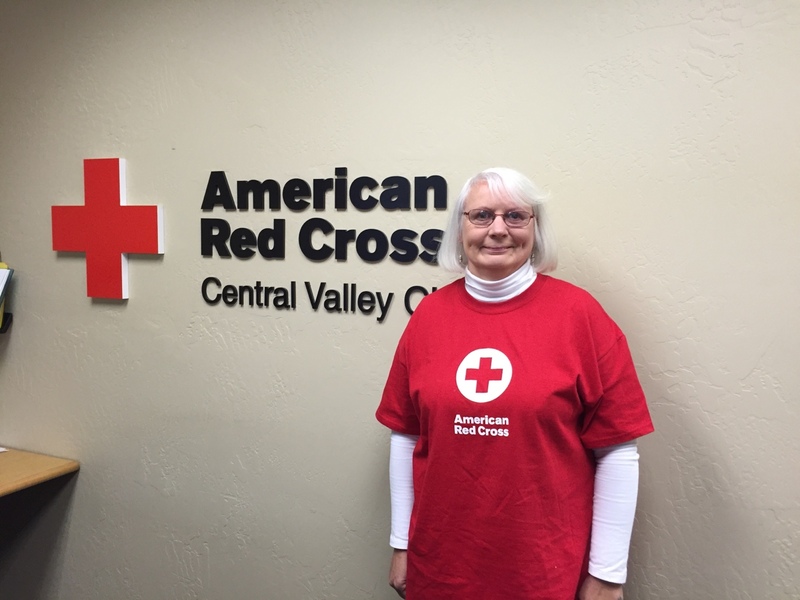 Hilary’s passion for the Red Cross comes from personal experience. During Hurricane Sandy, her 90+ year old mother-in-law was evacuated to a Red Cross shelter where volunteers provided her and other residents with lodging, warm meals, and comfort items. Then last summer, her small mountain community faced disaster when a wildfire destroyed neighbors’ homes. Her house was spared, but Hilary saw Red Cross disaster response first hand in her town. It was enough to inspire her to get involved. Hilary began to greet her students as they arrived to the Red Cross classroom, each with a handshake and warm smile. Some were there out of obligation for work, and others simply to learn a new skill. Either way, Hilary planned to inspire all of them to learn these new lifesaving skills and use them to make a safer community. All of the students were seated – a full class – and Hilary fired up the projector. Instructors like Hilary are part of the more than 90% volunteer workforce that provides humanitarian and public health services in the Central California Region. The Red Cross thanks and honors these selfless and compassionate every day heroes during National Volunteer Week, April 12 -18. Click here to learn more about the “Day in the Life of a Volunteer” series.